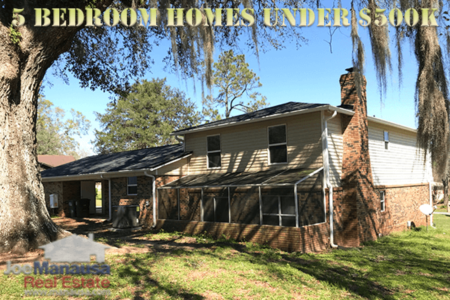 The segment of buyers looking for a home around $250,000 is as large as it has even been in Tallahassee, so I thought it might be interesting to explore the evolution of what $250K bought you in Tallahassee over the past 28 years. 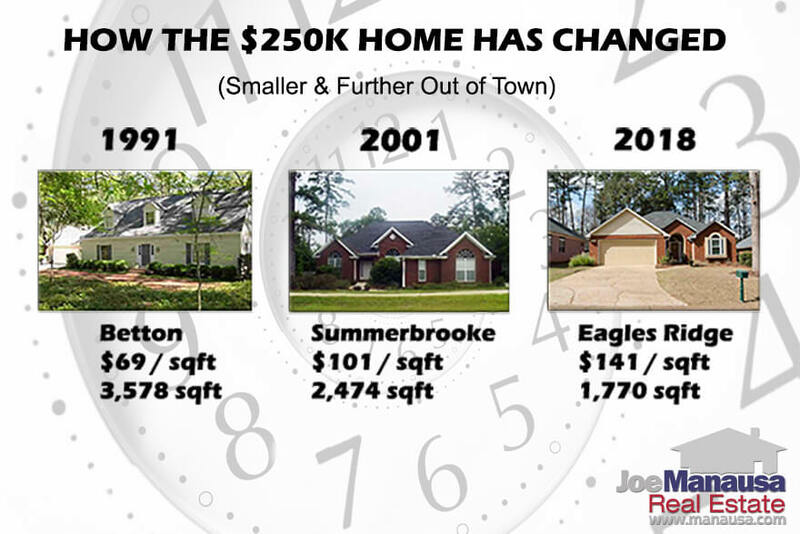 First, we'll start with a list of all homes for sale for $250,000, and then we'll show you how the $250K home has changed since I first entered the real estate brokerage business in 1991. 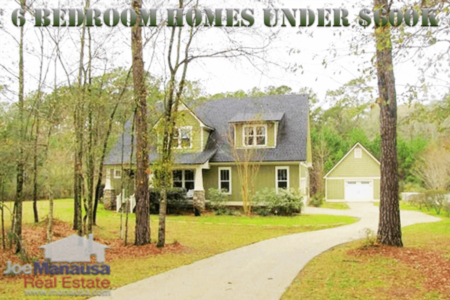 Finally, we'll close with a table of every $250,000 home sale in Tallahassee going back 28 years. Take a quick look at the three homes pictured below, and you'll find that history is showing that today's $250,000 home is smaller and further away from town than those in the past. In the early to mid 1990s, the average size of a $250K home was roughly 3,500 square feet. This year, that average is down 1,919 square feet, meaning today's $250K home is about 45% smaller than the ones you could buy 25 years ago. In the graph above, the number of homes selling each year for exactly $250,000 are plotted as blue columns and measured on the left vertical axis, while the average home size is shown in red and reported on the right vertical axis. Now that our market is almost 100% recovered from the housing market collapse (see how buyers were getting larger homes during the beginning of the recovery), rising costs driven by growth in minimum wage over the past 12 years will continue to bring the average home size down at this price. How Much Value Does $250K Buy You? This next graph shows that the average price per square foot of a $250,000 home in Tallahassee is approaching the all-time high set in 2006. Similar to the previous graph with unit sales plotted on the left axis, the right axis in the graph above (red) shows the average price per square foot of the $250,000 home sales in Tallahassee. This gives us perspective on value returning to the market and this year trails only 2006 and 2007 in how these homes were valued. While this is interesting insight, there is a flaw in the way we are looking at $250,000 homes in Tallahassee (as we show below). I think our findings would hold water under deeper scrutiny, but the sample size of choosing homes priced EXACTLY at $250,000 probably should have been expanded to a range of plus or minus five percent. As this daily blog is written each morning and posted before 9:00 a.m., I just don't have the time or resources to "geek out" mathematically and I am confident that 99.9% of our readers would agree. HOWEVER, if you would like to see this (or this type) of analysis done to a higher degree of confidence, leave a comment below and let me know. The following table shows the most recent home sales in Tallahassee that sold for exactly $250K. You are able to sort by any column-heading in the table, so take a look at what $250K bought you over the past 28 years or so. 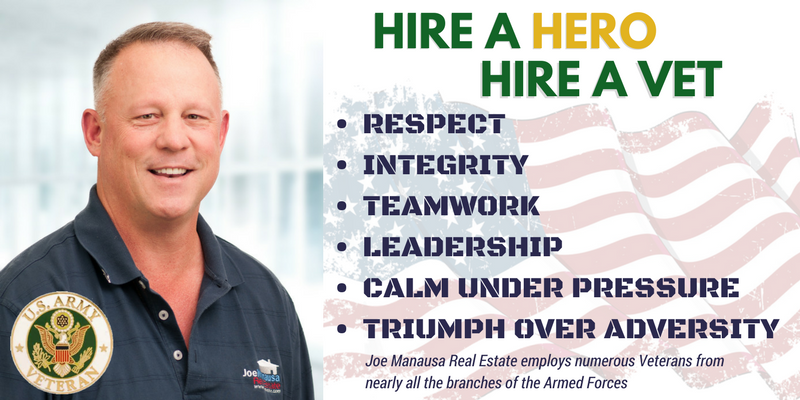 Whether you are in the market for a $250K home or at $2.5M home, you can expect 5-star service from the employees here at Joe Manausa Real Estate. If you'd like to start the process today, please give us a call at (850) 366-8917 or drop us a note and we'll be in touch right away. Off the subject slightly. My 78 year old friend owns an older home in Waverly Hills that he may want to sell in the next year. He thinks he can sell it "as is" and says, "let the next guy upgrade it". My thought is, someone buying a $250,000-$275,000 home isn't looking for a "Fixer Upper". Your thoughts? Great article, but I think you're also missing an opportunity to 'geek out' and also post more accurate numbers when you take inflation into account. $250k in 1991 is equal to about $460k today. That could buy you a nice in-town home.